“Oy! The delicious sacrilege!” Stacey exclaimed to her Facebook friends when she posted a photo of bacon-wrapped matzo balls she made last month. It’s the kind of dish that is so wrong that it’s right. The brainchild of Top Chef star Ilan Hall, we’d heard about this recipe a while ago, but worried about the implications that making it might have on our souls. Eh. We’ll worry about eternal damnation some other time… Right now, let’s focus on the recipe. After boiling the matzo balls, wrap each in a strip of bacon (we prefer the flavor of uncured bacon) and place it seam-side down on a foil-covered baking sheet. If the idea of wrapping a matzo ball in pork bacon just doesn’t jive with your dietary tendencies, go ahead and substitute for “turkey bacon.” Roast in a 400-degree oven for about 15-20 minutes, until the bacon is to desired crispiness. NPR highlighted a bacon-matzo ball recipe – enough to feed an army! – and Hall’s restaurant in a recent broadcast. Another possible sacrilege is promoting bacon on a blog focused on healthful eating. But don’t judge us so soon on that one. It seems bacon is a favorite (nearly) sinful indulgence for many of us. Keeping it in perspective is what’s important. Enjoy bacon in moderation as you would other fat sources. Yes, we know it’s hard. Some of the lower fat bacon options are worth a try, but may sacrifice taste and/or texture. Beware of sodium, too, as some brands of turkey bacon and lower fat varieties are higher compared with the standard. There is a tendency to eat more when we know something is lower in calories or fat, so there are instances when enjoying the real deal is worthwhile. What do you think of this recipe? Go ahead, cast the first stone! Do you use turkey bacon or other lower fat brands, and if so, what do you think? My grandmother, who converted, once served pork chops to the rabbi. I feel that it is just following family tradition to make this. Can’t wait! This is just insensitive. I don’t think people understand that pig in all it’s shapes are not only something that Jews don’t eat, but is something actually offensive. 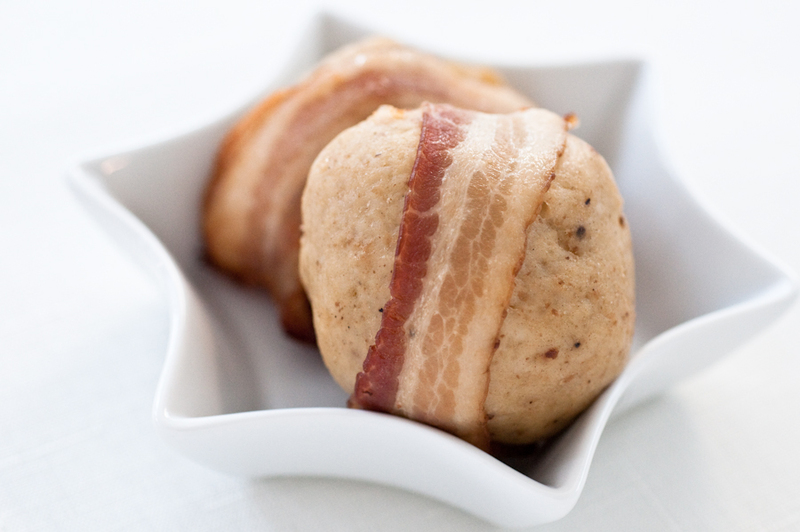 I think by wrapping bacon around a matzah ball, made from the bread of affliction, is an insult to humanity. @alayana get over yourself. Seriously. If you don’t like it, don’t make it. In all seriousness, insult to humanity? Missiles aimed at schoolbuses while claiming victim status sure, but a treyf wrapped dumpling? Me thinks you are being overly dramatic. Oh come on Elayna, get over yourself. I’m a Jew and I think they sound INCREDIBLE! Chill out and get off your high horse. Thanks for your question, Marie. We’ve never used baking powder in matzo balls before. Might be worth a try! As an Afro-American raised in part by a Jewish family i was delighted when i saw this show and recipe on PBS..for us gentiles who love many of the traditional Jewish food,this appealed tp me..a wonderful combo which i will make and serve Christmas eve at our Church…We are all in choice here.. so you like..you make ..if not so be it.